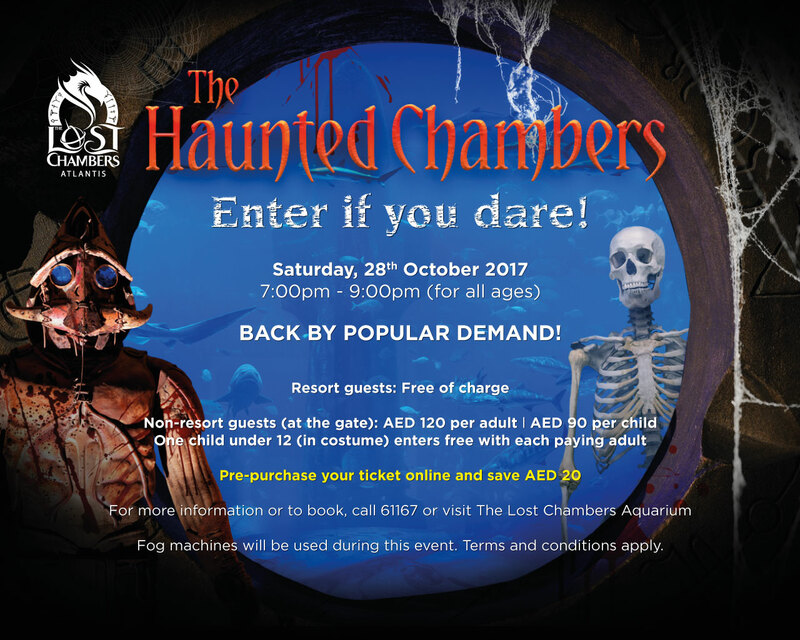 DUBAI, United Arab Emirates- As the spookiest day of the year approaches, it’s time for guests to pick out their fanciest dress for a string of freaky parties, brutal brunches and eerie events that will ensure guests of all ages have a terrifyingly good time this Halloween from 26th till 31st October 2017. 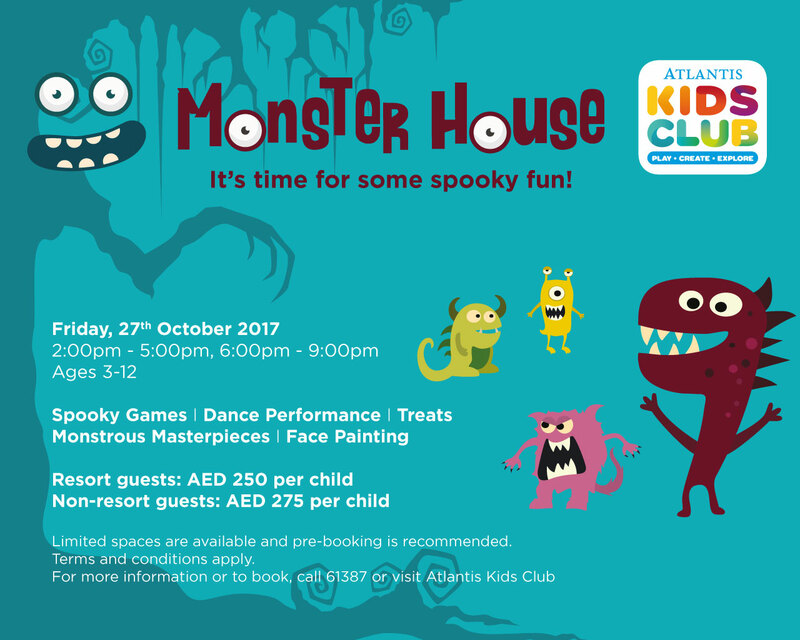 On Friday 27th October, little monsters, aged 3 – 12, can experience an array of gruesome activities at the Atlantis Kids Club Monster House. From 2pm to 5pmand 6pm to 9pm, the spooky schedule will include monster cookie making, spooktacular dance performances and creepy crafts, all with a chance to win a selection of petrifying prizes. 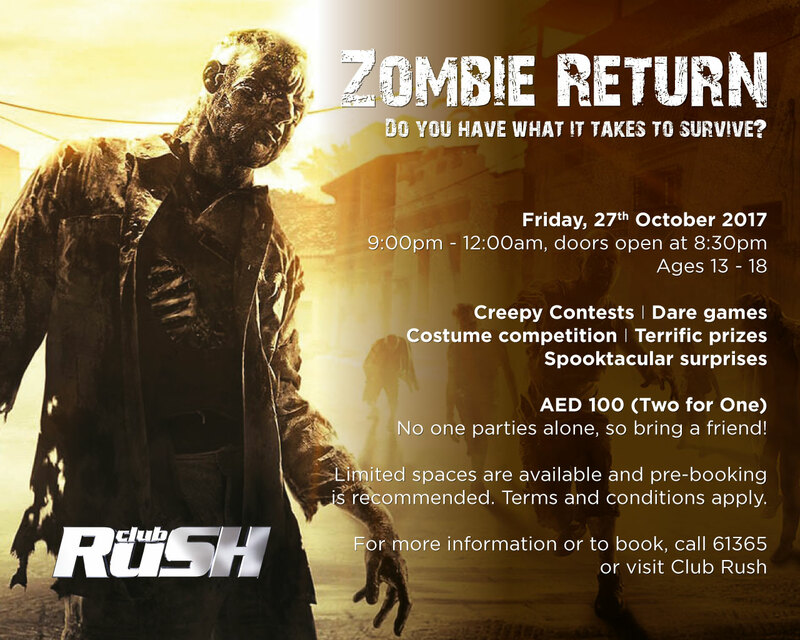 For those aged 13 – 18, looking for some frighteningly good fun, Club Rush promises a thrilling experience at the Zombie Return on Friday 27th October from 8:30pm onwards. Teens can make use of their survival skills and instincts to fight off Atlantis zombies and take part in dare games and contests to win a host of terrific prizes. For families looking for a terrifyingly good time, on Friday 27th October, Bread Street Kitchen & Bar holds its weekly Family Friday Brunch, with a beastly twist from 12:30pm to 4pm. With haunting stories, a Halloween themed culinary master class, ghostly decorations plus a pile of delicious treats – there will be plenty for everyone to relish – grown-ups included. Diners also get FREE entry into The Lost Chambers Aquarium. Children under the age of four dine for free. AED95 per child (aged 4 – 11), AED195 per person with non-alcoholic beverages and AED295 per person with selected house beverages, advanced bookings strongly advised. For bookings call 04 426 2626 or visit atlantisthepalm.com/Halloween. On Saturday 28th October, guests can end the weekend on a high note, celebrating Halloween with the family at Ronda Locatelli’s gory Saturday brunch from 12:30pm to 3:30pm. Little ghouls will be invited to paint their own monster-piece and make petrifying pizzas, whilst enjoying the haunting tricks of a monstrous magician, there is no better way to spend family day. Children under the age of 11 dine for free. AED195 per person with non-alcoholic beverages and AED295 per person with selected house beverages, advanced bookings strongly advised. For bookings call 04 426 2626 or visit atlantisthepalm.com/Halloween. Back by popular demand, on Saturday 28th October, little devils can experience an unboolievable adventure beneath the sea, in The Lost Chambers Aquarium from 7pm to 9pm. With activities including mysterious scavenger hunts and games, encounters with fang-tastic creatures, Halloween dance performances, fa-boo-lous photo ops and a sea of sweet treats, the evening is guaranteed to be an unforgettable visit to the aquarium. Ultimate Snorkel experiences and fish tales tours will also be awarded to those in the best costumes. Prices at the door start from AED 120 per adult and AED 90 per child, Under 12s in costume enter free with each paying adult. Pre-purchase your ticket online at https://www.atlantisthepalm.com/special-offers/halloween and save AED 20. On Thursday 26th October from 7pm to 3am, Nasimi Beach is back with its annual Halloween extravaganza, featuring BBC Radio 1’s Danny Howard. The hair-raising celebration will see the beach club transformed into a midnight freak show, featuring creepy circus acts, carnival freaks, sideshows and clowns to rival Pennywise. Upon arrival, guests will enter an abandoned carnival teaming with eerie performers and spine chilling clowns, but beware of “the sad clown”, who will be lurking in the shadows passing out magic drink cards from under his hat, which partygoers can then swap for complimentary drinks at the bar. Dress Code: Deadly scary (sharp or dangerous items will not be permitted) Doors will open at 7pm. Early bird tickets are on sale for AED 100 and can be purchased online at www.platinumlist.net. Tickets at the door are AED 150, ladies free before 9pm. For table bookings and more information, call +971 55 200 4321. On Friday 27th October from 12:30pm to 4pm, Saffron dares guests to show up to the Spookiest Halloween Brunch in the city. With costumes encouraged, those with the best outfits will be rewarded with gruesome gifts from Halloween favourites including Freddy Krueger, Hellraiser’s Pinhead and Jason Voorhees, whilst a resident DJ thrashes out some frighteningly awesome Halloween beats. Guest can also indulge at the zombie shots bar complete with smoking shooters including Hannibal the Cannibal, Pin Head Colado, Daiquila Dracula and more. 21 years and above, AED535 per person, advanced bookings strongly advised. For bookings call 04 426 2626 or visit atlantisthepalm.com/Halloween.